The Mozambican currency is Meticais, but Rands and US Dollars are widely accepted, just be prepared to pay a premium during the exchange. 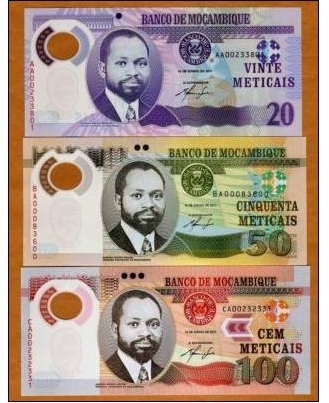 On July 1, 2006, Mozambique redenominated the metical at a rate of 1000:1. The new ISO 4217 code is MZN. New coins and banknotes were introduced on July 1, 2006, and the transitional period during which both old and new meticais could be used lasted until December 31, 2006. During the conversion, the new currency was locally abbreviated as MTn, but has since largely returned to MT. Whatever you do do not change money on the immediate Mozambican side of the Komatipoort/ Ressano Garcia border post. - You will hear touts shouting rates that are 10-30% better than the current going rate but if you decide to change money there, usually one of two things will happen. Either they will grab your money and run into the adjacent shanty town never to be seen again, or you will happily exchange money only to be conned. Later you will realise that they have either miscounted (half or folded notes) or snuck in similar looking, old (invalid) notes between your stash. Rather exchange at a reputable location like a hotel in Mozambique or use your credit card to draw cash at ATMs. If you do change face to face, always count theirs first, then hand over yours. It is safest to divide the transaction into smaller exchanges of R1000 or less per transaction.